We offer guided trips for travelers who seek some adventurous elements in Shikoku and the Seto Inland Sea. Sea kayak, SUP, cycling or simply walking are great ways to explore this wonderland. With local knowledge of nature, history and legend around the area, we offer you the best of Setouchi and Shikoku while taking care of your comfort and safety. 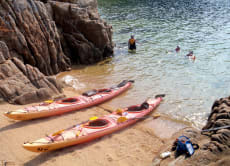 Embark on a Sea Kayaking Adventure in the Seto Inland Sea!